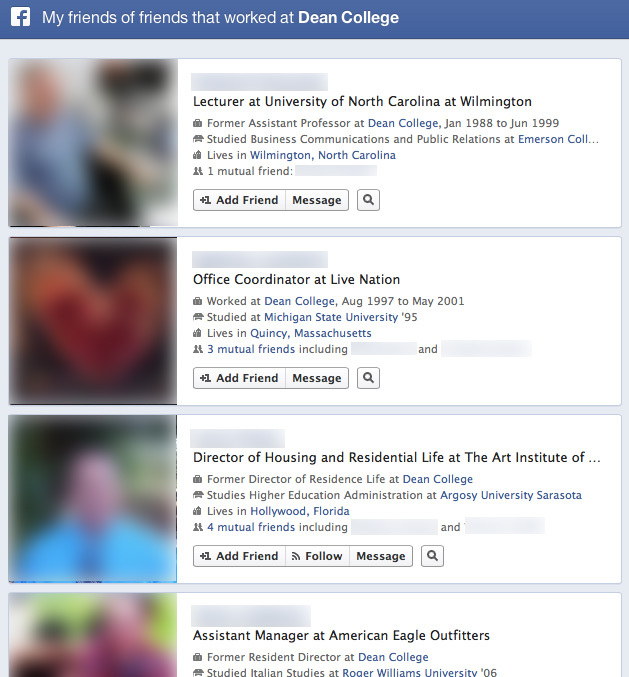 Facebook Graph Search proves just how important building up your social network contacts can be. This new search feature, which has been slowly rolling out over the past few months, allows one to make “micro-level” searches. For instance, you can search for “my friends that like Lionel Richie” or “my family that visited Peoria.” These are just a few suggestions, but the options go much much further. If you have the feature through Facebook, you can try their guided tour here. 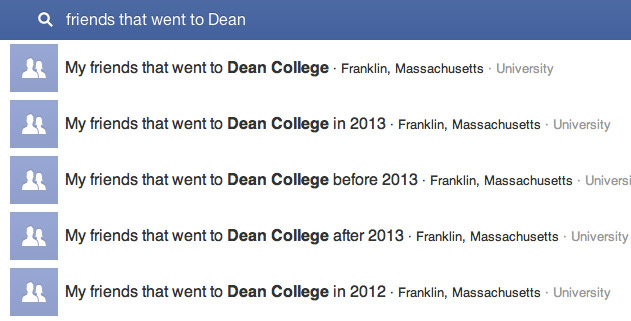 But then, I realized I could search for “friends OF FRIENDS that work/worked at Dean College.” Blam! There was a list of individuals including the mutual friends that connected us. As you can tell from looking at this, the implications for this are huge. Never has it been so easy for one to make connections through their social networks. LinkedIn offers a similar feature, but because it does not possess the sheer volume of information that Facebook does, it cannot get into microlevel detail. Try searching for a running partner by searching for “friends OF FRIENDS that work/worked at Dean College and like running.” Craziness. For the job searching grads and others out there, a Facebook Graph Search should now be a standard part of your job interview research.